Ninety-two-year-old Rodolfo Rodriguez walks around his neighborhood every day, usually with his wife. 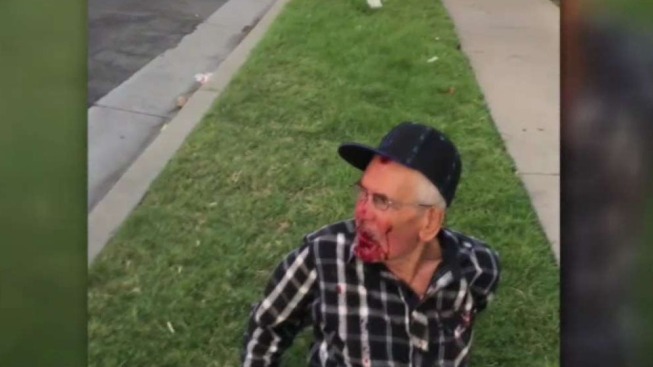 But on the Fourth of July, Rodriguez says a woman beat him with a brick after he bumped into her toddler on the sidewalk just a few feet from his home in Willowbrook. Once on the ground, a group of men started kicking him until a bystander saw what was happening and called 911. The female attacker told Rodriguez, a legal U.S. resident, to go back to his own country. "I see her hit him," said Misbel Borjas, the woman who called police and recorded the video on a cellphone. Rodriguez was hospitalized with broken ribs and severe cuts to his face. The Los Angeles County Sheriff's Department has launched an investigation to find the attackers. "Who would do this to anybody?" said Rodriguez's grandson Erik Mendoza. "A 92-year-old senior citizen, what can he do to anybody? There's no harm that he meant." Rodriguez wants his assailants to be punished and to pay his medical bills. "It was their fault they tossed me to the ground," he said. Anyone with information is encouraged to contact the Sheriff's Department at 323-568-4800.